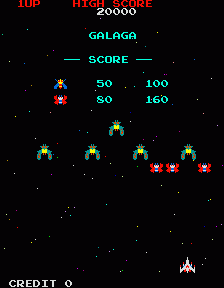 One of the most popular of the classic arcade games, Galaga is the definitive shoot em up. The simple(!) game objective is to destroy all the enemy spaceships, while avoiding contact with them and the bullets they fire at you. The ships swoop down on you from off the top of the screen in formations, spinning and firing a multitude of lethal ammo towards you. 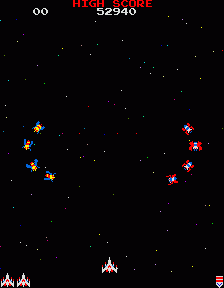 Then they fly back up, to line up in a Galaxian style formation expanding and contracting at the top of the screen. 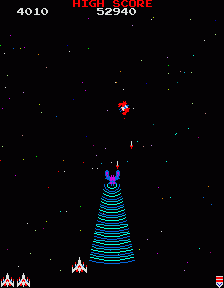 When all the enemy ships you are to fight are in the Galaxian formation they then break from their ranks and swoop down on you again, either singly, in pairs or in threes, trying to hasten your death in another hail of deadly bullets. The four boss ships per screen which form in the top line have a special ability shown in the right hand screenshot at the top of the page. They can stop a third of way up the screen and emit a tractor beam down towards your ship. If your fighter comes into contact with this beam, it is 'captured' and the alien ship flies away with your ship. Your next fighter is then launched, and if you can destroy the boss ship which still has posession of your original fighter (without shooting your ship) your first fighter will be released and spin down to 'dock' with your new fighter, giving you two linked ships with double the firepower, but of course double the size to avoid the bullets. Every few screens you clear you enter a 'challenge stage' where formations of alien ships and creatures fly round the screen in predefined patterns. They do not fire at you, and points are awarded for clearing entire formations, and at the end of the stage you receive bonus points depending on how many ships you have shot. There are a series of symbols which appear at the bottom right of the screen to show which level you are on for every level, 5, 10, 20, etc. Extra lives are awarded for 30,000 and 80,000 points. Scoring Yellow/blue bug ship: 50 points in formation or 80 points in flight. Red/white bug ship: 80 points in formation or 160 points in flight. Boss Ship: 150 points in formation or 400 points in flight. Boss Ship: 800 points in flight with one wingman. Boss Ship: 1,600 points in flight with two wingmen. Bonus Stage: 100 points per ship destroyed. Bonus Stage: 10,000 points for destroying all 40 ships. Player two's score displays an extra digit, so to show scores over 1,000,000 points play as player two. Try to get your first fighter captured on level one. This makes the early levels significantly easier. Learn the patterns of the challenge stages and use this knowledge to shoot all 40 and get the 10,000 points bonus as this is the biggest single score available in the game. At the start of each screen the ships attack in formations, spinning round and a few break off to fly off the bottom of the screen. These will not return to the game. Ships spinning in a formation at the left of the screen will break away to swoop down on you to the centre and right, and those on the right fly down the centre and left.